bebop spoken here: Review. 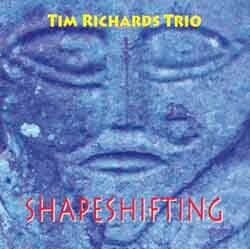 Shapeshifting - the Tim Richards Trio. Tim Richards (pno), Dominic Howles (bs), Jeff Lardner (dms). The question that immediately springs to mind is - do we really need another piano trio? The answer is probably no with the proviso - that there are a few exceptions and the Tim Richards Trio is one of them. This is no cocktail lounge, dinner jazz, ensemble - although I'm sure they can make that scene too - Tim, Dominic and Jeff live and operate but a short chorus from the cutting edge. Bud Powell's Un Poco Loco, Cedar Walton's Bolivia and Bobby Timmons' This Here stand up well against the composers' own versions whilst Ellington's Prelude to a Kiss and Come Sunday build upon the rich harmonic structure of the originals. Individually they solo with no shortage of technique - long flowing lines interspersed with chordal passages reminiscent of Bud Powell from Tim. Dominic is solid throughout and Jeff driving and sympathetic. Together they swing. Swing seems to be a passé word these days but it remains the vital element required to validate the authenticity of a jazz performance.